What’s better than getting dressed up, eating way too much candy, and hanging with friends? Doing it while getting turnt’! Halloween is fast approaching and with it comes the question of: ‘what will you do’? Since trick-or-treating is definitely off the table, what better way to celebrate than with a good ole’ Halloween themed drinking game? Incorporate the classic game of bobbing for apples with a college favorite, Jungle Juice. Mix your favorite concoction of beverages into a large tub and insert apples with numbers carved into them. The numbers will correlate with the amount of shots the bobber must drink after chewing on the delicious alcohol-soaked apple. Okay, maybe adults can have a bit of fun with this traditional method of celebration. Line up six non see through cups and number them. In three place a ‘treat’ shot, and in the other three a ‘trick shot.’ Have players roll a die and drink the shot in the matching cup. Not knowing if you’ll be downing fruity vodka or the crap alcohol your aunt bought you for your 21st birthday is half the fun! You may just want to chill and warm up to the inevitably awesome night ahead of you with a scary movie. If you are familiar with the movie, you can make up your own rules – e.g. take a shot every time the theme song plays in Halloween, or chug a beer every time you hear one of Jigsaw’s many catch phrases in Saw. The good news? You’ll be so buzzed by the end that you won’t be too scared to go to the bathroom by yourself! It’s easy to transform any usual drinking game to one that is a bit creepier. Is beer pong your thing? Color a creepy eyeball on the ball. Fan of Kings? Replace the usual red solo cup with a plastic pumpkin to place in the center of the cards. If you’re feeling especially festive, swap it for a hollowed out pumpkin. Let’s be real, drunk you doesn’t care about a few seeds. 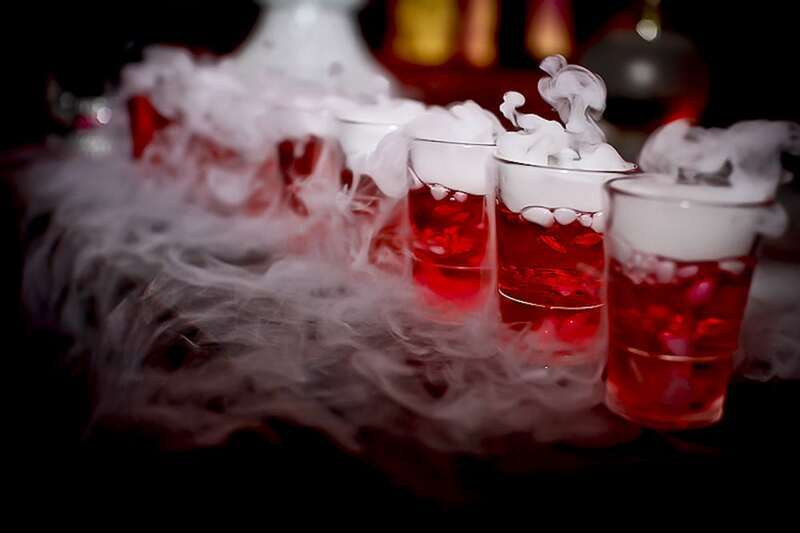 Halloween themed drinking games can spice up any party or pre-game. Incorporate some fun themed cocktails to enhance the atmosphere and liven up those dead!